A secretive wader, the Little Green Heron may be hard to find sometimes. It spends a lot of its day under the cover of low overhanging branches at the water's edge in an attempt to find food like plants, fish and insects. Less than two feet tall and not possessing the long neck of the other herons, the little green heron can maintain a motionless hunting position for a seriously long while. 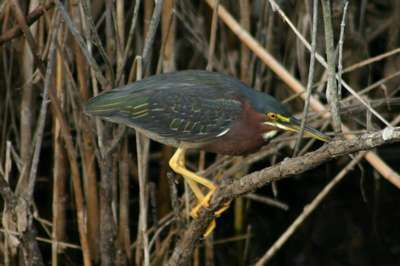 The little green heron's coloring varies like many of the large wading birds. A new bird spotted on the lower Gulf Coast might be named "the little maroon heron", because of the intense maroon coloring. Little green herons in Everglades National Park (middle picture below) show why they are named as such.